Note: If you are interested in using MUSTANG-2 in the future please see the note below about the status and plans for future GBT observing. A new, microstrip-coupled detector design yields higher sensitivity and less susceptibility to environmental microphonics. Detectors are feedhorn coupled, with the sum of two linear polarizations measured by a single TES per feed. 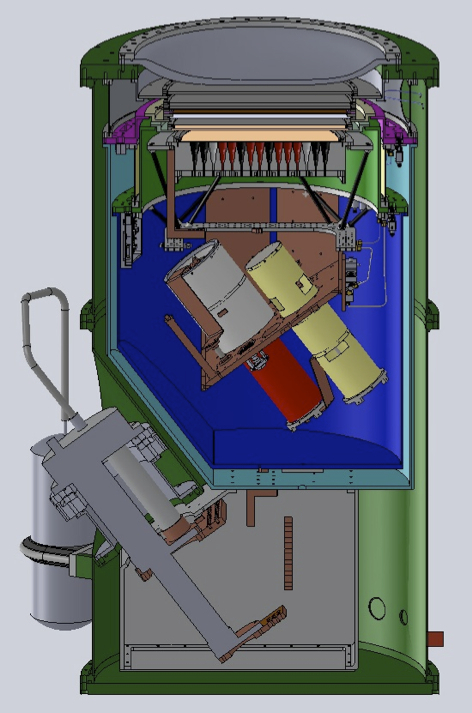 The receiver design incorporates a tilted refrigerator and receiver rotator, resulting in much lower dependence of cooling performance on telescope elevation. The detector readout is the first astronomical use of microwave resonators to multiplex TES bolometers. MUSTANG-2 has been developed by a collaboration including the University of Pennsylvania, NIST, NRAO, the University of Michigan, and Cardiff University. All critical MUSTANG-2 systems have already been proven in operation on the GBT in early 2015 during an engineering run using a partially populated version of the receiver ("MUSTANG-1.5", which had 64 populated feed horns). The demonstrated sensitivity of MUSTANG-2 on the GBT in good weather on the GBT is 73 micro-Kelvin main beam temperature (RMS, Rayleigh-Jeans) in one hour of integration. The 73 micro-K sensitivity corresponds to 56 micro-Jy/bm RMS in terms of flux density (for SZ proposers please note: 56 microJy/bm is roughly a 2.0e-5 RMS in Compton y for the GBT beam, including near sidelobes). This is with a 2'.5 radius "daisy" scan pattern which produces a centrally weighted sensitivity profile over a ~6' FWHM region; see figure below for the radial profile of sensitivity seen in such maps. 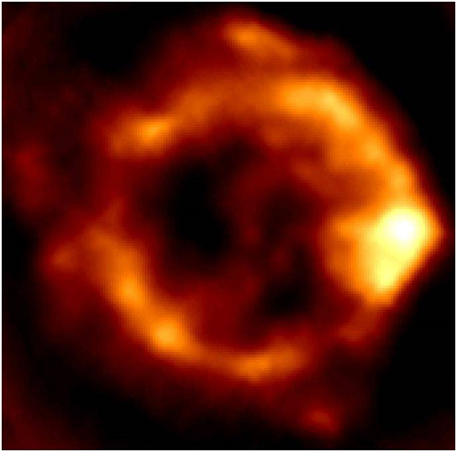 Smaller scan patterns with lower noise in the center are possible, although significantly smaller scan patterns may be more susceptible to subtle imaging systematics and are not recommended except in special cases such as targeted point source photometry. For significantly larger areas faster scanning can be used which will reduce the noise by up to 35% ( note: by a 35% reduction in noise, it is meant that the expected noise be multiplied by 0.65). Proposals must explicitly state a target map RMS in order to be evaluated for scheduling. ERRATUM: please ignore the 42 micro-Kelvin number in this figure, 73 micro-Kelvin (RJ) is the correct number. The Jy/bm number is still valid. This sensitivity assumes an effective smoothing of 9".85 FWHM. 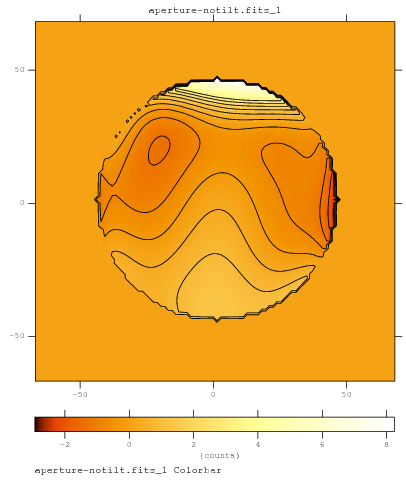 If heavier smoothing is acceptable the sensitivity is better by a factor of (FWHM/9.85 arcsec). 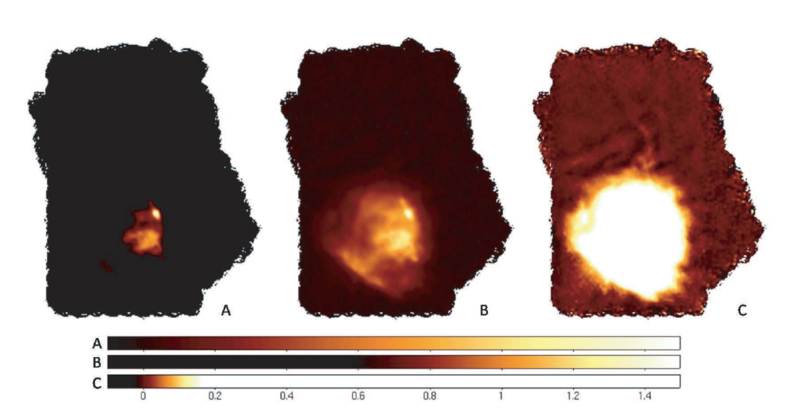 Extended emission on scales up to 5' should be imaged with reasonable fidelity, but faint emission more extended than this may be difficult to detect. 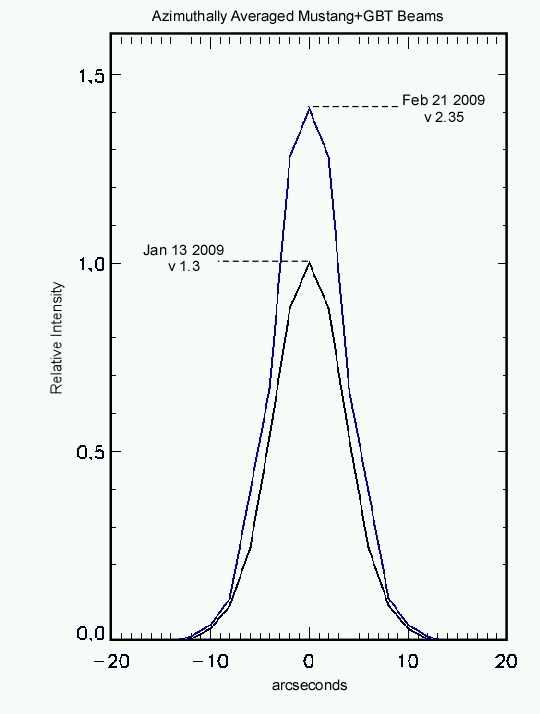 Bright emission (20 mJy/beam or more) can be reconstructed over scales of many arcminutes. The angular resolution of MUSTANG on the GBT is tyipcally 9" (FWHM) and the instantaneous field of view is a 4' diameter circle. Allowing for weather and calibration and observing overheads, observers should conservatively allow an observing efficiency of 50% (i.e., assume equal times integrating on source, and for calibrating and general overheads - so 100% overheads relative to observing time). 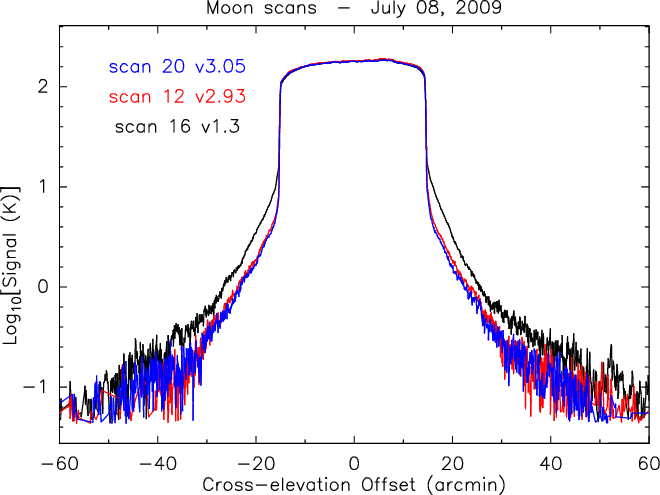 A minimum setup and calibration time of 1 hour is generally required for each observing session. Daytime observing at 90 GHz is currently not advised. The changing solar illumination gives rise to thermal distortions in the telescope structure which make calibrating 90 GHz data extremely difficult. Useful 3mm observations are currently only possible between 3h after sunset and sunrise. Please contact Brian Mason (bmason - nrao - edu) with further questions. In order to cope with an evolving funding landscape the GBT is in the process of moving to a model which relies upon a larger fraction of private and collaborative ("pay-to-play") partnerships. It is expected that a significant fraction of GBT time, depending on the future level of NSF funding, will remain open under something like the current proposable, open-skies arrangement; however the mix of observing capabilities that is available under this arrangement is TBD. If you are interested in forming or contributing to such a partnership to ensure continued access to MUSTANG-2 on the GBT, please contact the director of the Green Bank Observatory, Karen O'Neil. We request that publications resulting from MUSTANG observations on the GBT include the following acknowledgement: "The authors would like to thank the MUSTANG instrument team from the University of Pennsylvania, NRAO, Cardiff University, NASA-GSFC, and NIST for their efforts on the instrument and software that have made this work possible. ". Additionally, we request that you cite Dicker et al. (2008) in the paper text. NRAO offers page charge support if you do a few simple things. February 2009 NRAO e-news article about MUSTANG. February 2009 and May 2009 NRAO e-news articles about GBT surface improvements. MUSTANG-2 has been installed on the GBT with upgraded readout multiplexers and 211 detectors working. Observing on shared risk science proposals in collaboration with the instrument team have begun. The full MUSTANG-2 camera achieved first light on the GBT in May, 2016! It will return to the GBT in fall 2016 for shared-risk science through the 2017-A Green Bank Observatory proposal call. The NSF ATI program has funded our proposal to fully populated the MUSTANG-2 focal plane with 215 dual polarization detectors. The completed MUSTANG-2 receiver is expected to arrive at the GBT for commissioning & early science observations early in 2016. MUSTANG-1.5 was successfully integrated with the GBT and first light observations of a variety of sources obtained. This run allowed the team to shake out final integration issues with the telescope and software systems, and constituted the first astronomical use of MKID-style microwave resonators to read out TES detectors. MUSTANG-1.5 arrived in Green Bank and is preparing for first light on the GBT later this month! 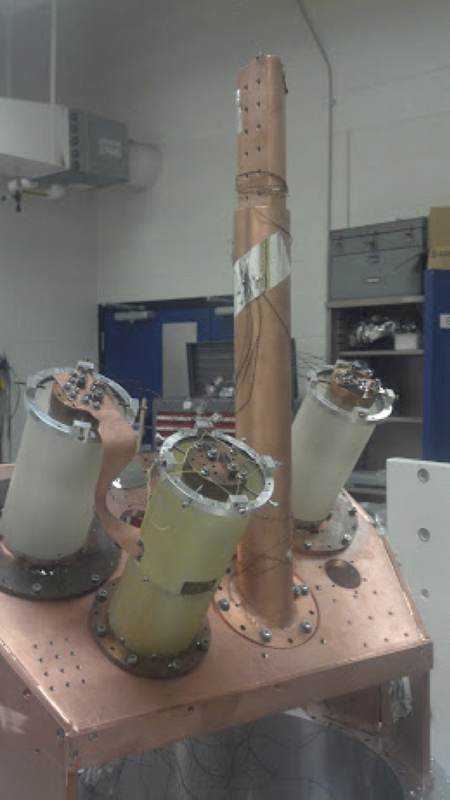 MUSTANG-1.5 is currently being integrated and tested in the lab at U.Penn., with first light on the GBT scheduled for winter 2014. MUSTANG-2 Detectors delivered to U.Penn! In June 2014 72 packaged detectors were delivered to U.Penn for testing and characterization. Left: Cutaway view of tapered feed design; Right: the final MUSTANG-2 feed horn array as fabricated (223 feeds). 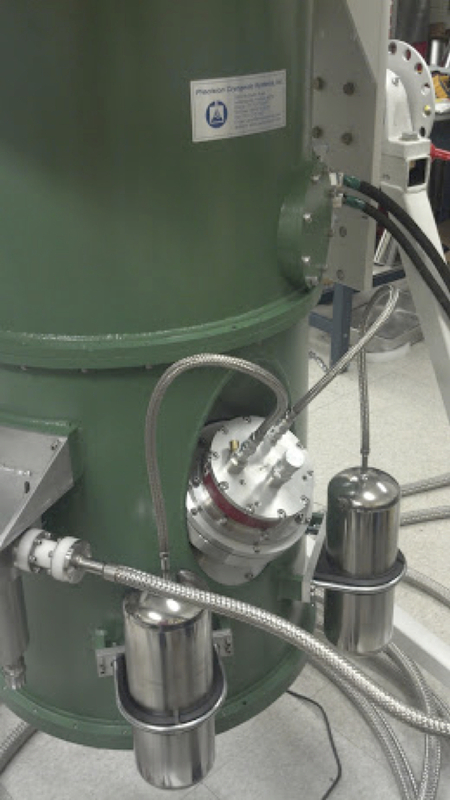 The feed array weighs 8kg and has been successfully cooled to 300 mK in the MUSTANG-2 cryostat. Pictures of the receiver in the lab at U.Penn. One ROACH board with its custom daughter cards for the microwave resonator readout. MUSTANG-- the original 90 GHz, 64 pixel GBT bolometer camera-- was retired at the end of calendar year 2013 in anticipation of the arrival of its successor, MUSTANG-1.5 MUSTANG proposals were accepted from June 2009 through Feburary 2012. 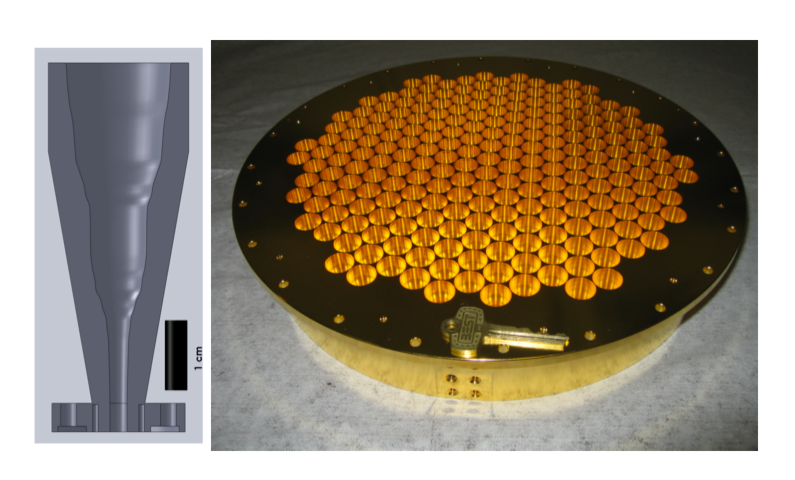 A concerted campaign of phase coherent holography measurements and actuator repairs has resulted in further, remarkable improvements in the GBT surface: the current Ruze-equivalent surface RMS is estimated to be better than 275 microns rms! 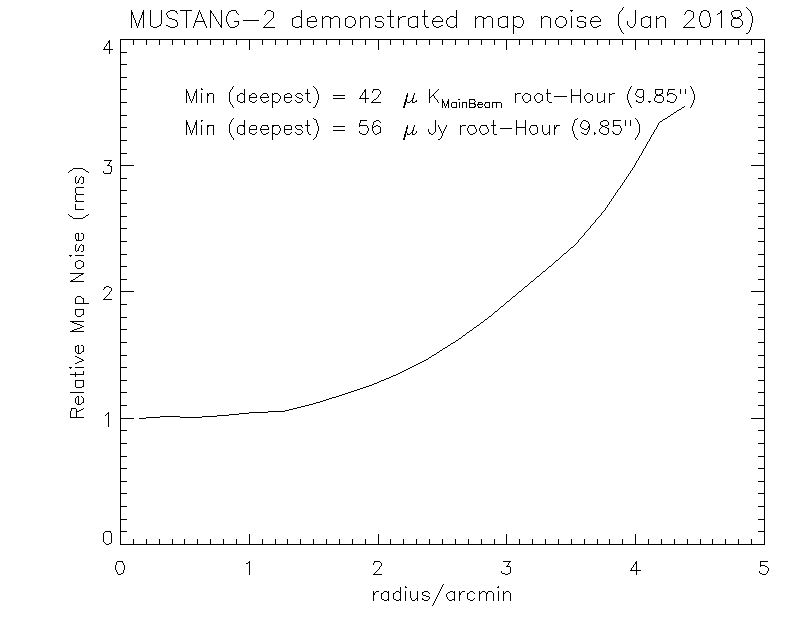 This means that MUSTANG should be at least 50% more sensitive than it was for Spring 2009 observing. The following image shows a sequence of surface maps made over the course of the year. The campaign of traditional, phase-coherent holography led by Todd Hunter & Fred Schwab is paying off, having already yielded a factor of two improvement in the GBT 90 GHz aperture efficiency with more improvements on the way. More information can be found in the February and May NRAO e-news. 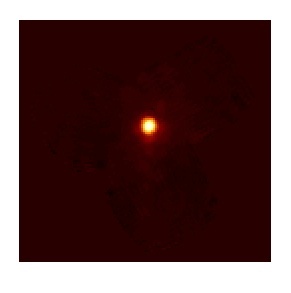 Using "out-of-focus" or phase-retrieval holography techniques, it is possible to make real time measurements of the medium to large scale aberrations in the GBT surface by analyzing in-focus and out-of-focus beam maps of bright calibrator sources. Acquiring the data, analyzing it, and applying the resulting corrections to the telescope surface requires less than 15 minutes with MUSTANG, and the process is essentially completely automated (requiring the user only to push a button to accept & send the solution). In focus (center) and two out of focus (left, right) maps of a bright point source. 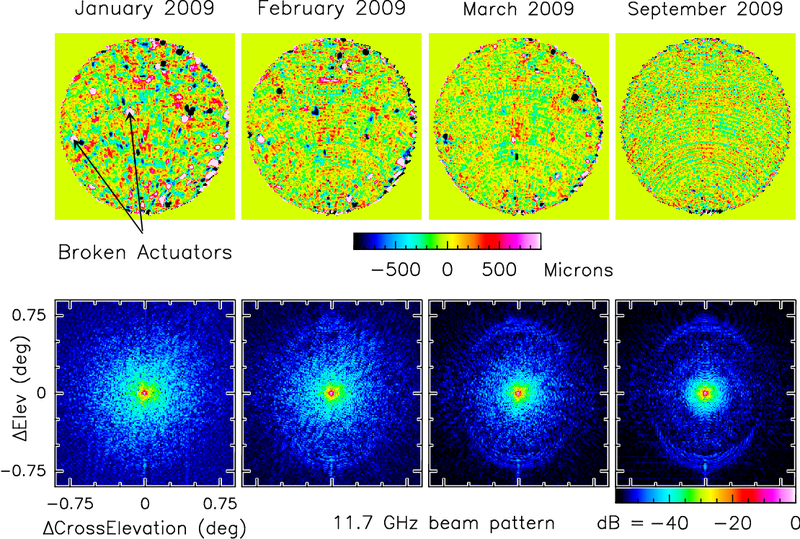 Left: GBT phase error map derived from the beam map data above. Color scale is in radians; note that since MUSTANG only illuminates the central r=45m, the phase at the outer edge of the dish is unconstrained and not important observationally. Right: The beam that results from applying the aperture phase corrections to the telescope (on a slightly burned in scale, common to all four beam map plots). Near-in sidelobe levels are lower and the peak foward gain is typically increased by 20-30%. MUSTANG+GBT 90 GHz map of Orion on 3 color scales emphasizing the dynamic range and sensitivity to extended structure that has been achieved. These maps resulted from early science observations in Spring 2008; the area covered is approximately 5'x10'. 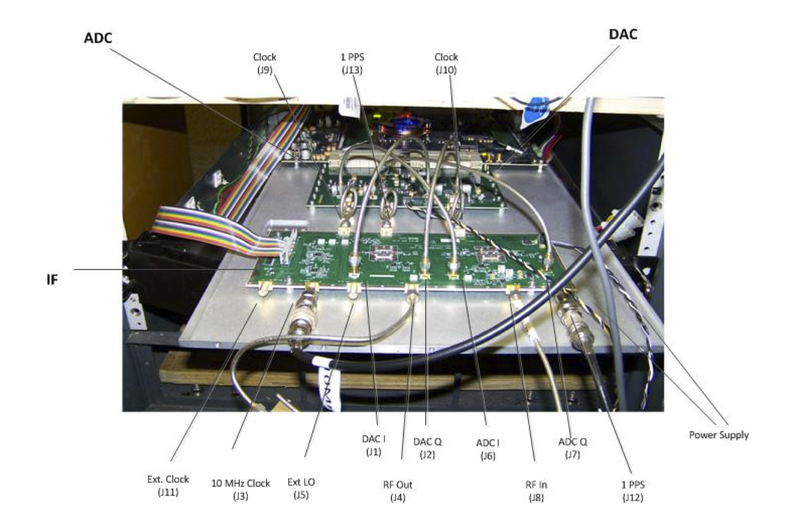 MUSTANG+GBT map of Cas A collected during commissioning, January 2009. 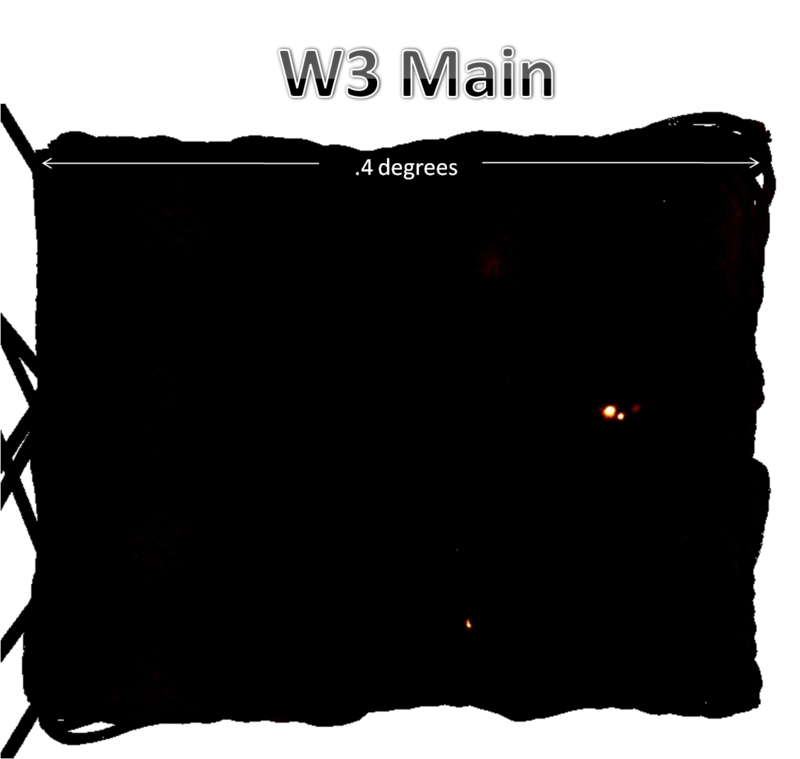 MUSTANG+GBT large-area map of the W3 region (0.4 deg x 0.3 deg). This map required 45 minutes to collect and was a test of MUSTANG's large-area mapping capability. Due to the high slew speeds involve it is possible to suppress instrument and atmospheric "1/f" noise to a greater extent than is possible when mapping smaller fields, resulting in a 25% improvement in sensitivity.